The city's dog runs, reviewed, one gravel pile at a time. 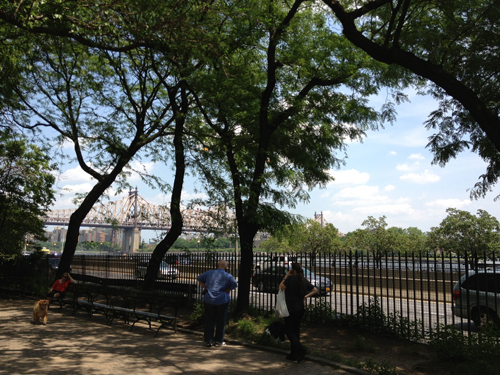 This week: Peter Detmold Park, on FDR Drive. Obviously, the number one factor in choosing a dog run is how far is it from your home. For the sake of reference, however, we’re going to attempt to compile info on as many NYC dog runs as humanly possible, because you never know when you’re going to move, a jerk is going to move onto your regular run turf or your dog may wish to move his bowels elsewhere. 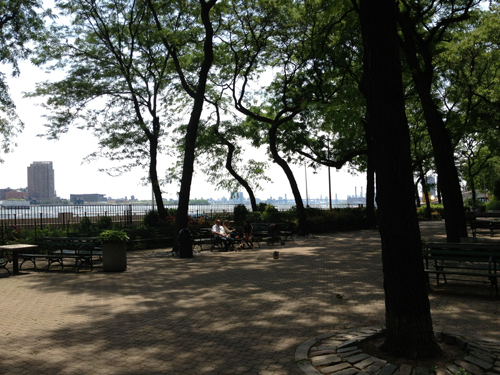 Basic Stats: Despite its proximity to FDR drive, this run feels like something of a secret garden. Nestled in the land of UN residences and consulates, it’s a truly classy affair with water, bags (sweet sweet bags!) and a mix of pavement and dirt in one purty little setting. Placement in the Park: The park, which is small, is reached by going to down a set of public stairs at the end of 51st Street. 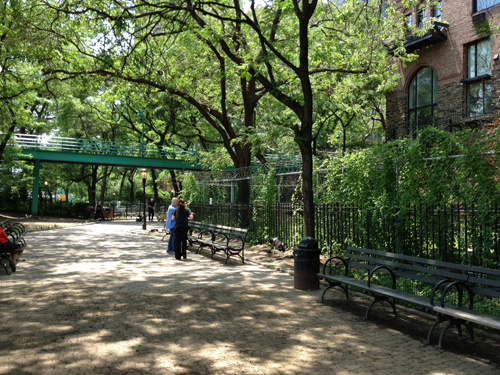 The dog run is located under a pedestrian bridge over FDR drive, nestled between some beautiful old buildings. While the run is the only designated/fully loaded dog zone, the whole park is sunken and enclosed with fencing, and on a beautiful day, dogs have a run of the whole place, in and out of the official dog zone. Vibe Inside: The entire park is fairly chill — being small, off the beaten path and free of any outsider attractions, it’s limited mostly to locals (hence the lack of issue with having off-leash dogs in the non-dog run area) — and the run is equally mellow, although, as an outsider, I did get a few looks and hear a few people loudly notice how they’ve never seen the run so crowded. Of course, I can’t blame them — not just because it was crowded on such a gorgeous day, but because if that was my local run, with its covert location, ample bag supply and greenery, I would be fairly protective of it as well. Cons: The stairs going down to the park might be challenging to an older person (and impossible for anyone handicapped), and while the majority of the park is paved with stones, there are some dirt areas that probably turn to nightmare mud pits in the rain. As with most of these riverside runs in Manhattan, public transportation doesn’t stop very close by. 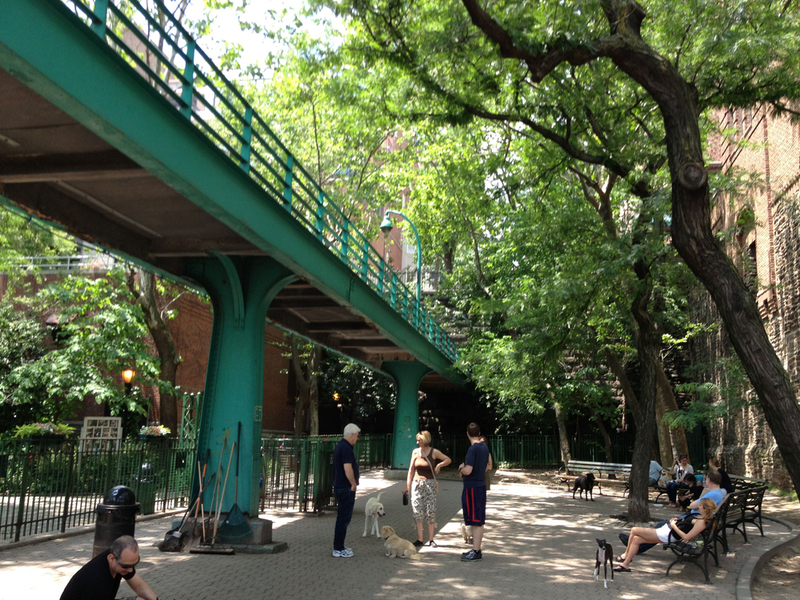 Pros: This is one of the few charming dog runs I’ve been to, thanks to its placement underneath the footbridge and its L-shape, which means there’s a small area off the dog run with more benches and a lovely old tyme street lamp. And bags, bags, bags! Food? : There are way more cars with UN plates than places to eat, but there are some outdoor cafes on 1st and 2nd Avenues. "Dog Run Reviews: Hudson River Park at Pier 84"
"Dog Run Reviews: East River Park"
"Dog Run Reviews: Chelsea Waterside Park"